How do archives support communities? Purchase your copy. See the early reviews! Learn more. Now available through Amazon.com and other distribution outlets. A session I chaired at a regional museum conference discussed promoting local cultural heritage organizations through collaborative archives ventures. The panel focused our presentation on historical societies and small museums, which usually serve as the linchpins for local history projects. The speakers included representatives from various-sized communities in Massachusetts that conducted archival surveys and used consulting services to guide them in collaborative endeavors. Our session aimed to show how underutilized, under-cared-for, and underfunded historical resources could be revitalized and could become a showpiece for one's institution and town. We explored how to begin a project to gain control of collections. We emphasized that archives collaboration could help the overall mission of an institution. One audience member particularly struck me. At the end of the session, she stood up and said that the ideas we discussed are ones she had been contemplating and has slowly started bandying to organizations in her town. However, she had been hesitant to speak to local institutions, afraid that her ideas were too unusual and that she was stepping on toes. Our session helped the audience realize that movement toward community collaboration was a forward-thinking concept. Working together, institutions that handle the cultural resources of a community could better raise awareness of local history, the management needs of local historical materials, and the ways such resources can boost a town or city. "Collaboration" is becoming the new buzzword in the nonprofit community. In an effort to reinvent ourselves during changing times, cultural heritage institutions such as archives, libraries, and museums are forging new partnerships. In a time when so much information is right at our fingertips, our users expect us to be "plugged in." Gone are the days when cultural institutions could operate in a vacuum with their eyes on their own bottom line and mission statement. We now must meld into the world around us, creating new networks that provide more efficient pathways to information. The cultural resources we possess can become a backbone for knowledge and community identities, creating an accurate documentary record that reflects our towns, its citizens, and the world in which we live. It is unusual and difficult for institutions to reprioritize, putting the goals of the many ahead of the one. Working with others is often no easy task. But cultural heritage institutions must recognize that our success (and, indeed, our very existence) depends on how our presence is perceived by our communities. While budgets are slashed, we have the opportunity to position ourselves as vital to society. The alternative is to fade away with our limited funds and limited audiences. Partnerships between the historical societies my fellow speakers represented, local libraries, town governments, educational institutions, associations, and local businesses have allowed them to gain a more visible community presence. Viewing their examples, audience members saw tangible evidence that organizations can come together with a common goal of sustaining a sense of community through the promotion of cultural heritage resources. By connecting cultural organizations to the heart of a community's pulse and character, we can create a stronger awareness of our vitality and how we can benefit diverse members of society. If we love history, we know that the historical materials that cultural heritage repositories maintain are important for preserving our past, defining our identity, and highlighting the individual's purpose as a member of a larger whole. It is our challenge as keepers of collections to convince others of the worthiness of our mission. There is a long-established, natural bond between cultural heritage institutions of all sorts. In the world of professionally run cultural heritage institutions, museums, libraries, and archives preserve and pass on culture, serve as civic centers, assist economic development, work as recreational centers, and play an important lifelong educational role for their patrons. All possess resources that reflect culture and help us evaluate society. For decades, these institutions have operated in distinctly separate spheres with diversely trained and degreed professionals who use separate theories for operation. Alternately, volunteer-based organizations tend to meld the care of artifacts, publications, and archives. While librarians, archivists, and museum personnel work to bring their professions closer so that they may collaborate, they must also recognize the partnerships they are required to forge with their nonprofessional colleagues to attain success. Historically, cultural heritage institutions have always had shared missions. It is time for us to re-explore them and make them part of our everyday thinking. We must acknowledge our differences and explore parallels, maintaining distinct identities and practices while leaning on similarities to forge collaborative partnerships among all ranks of cultural heritage workers. This book focuses on the role of archival resources in our missions. It discusses the value of archives for creating an accurate documentary record and for supporting our other collections. The fields of librarianship, museology, and archives management follow distinct practices today, yet they are all similar in that those who work in these fields are the handlers of many of our civilization's most culturally significant materials. These include resources that enhance identity and intellectual development. I have worked in all three fields in various stages of my education and career. I propose that it is records that have the greatest capacity for pulling local organizations together as a cultural collaborative. The creation and maintenance of records is threaded through everything that we do as a society. Everyone makes records, and everyone needs to maintain them, file them, or dispose of them. Records exist in a multitude of formats in every institution and every residence in the United States. The audience for this book includes anyone handling historical records, in any setting, at any level of employ. Professionals familiar with managing archives will benefit from its review of theory, overarching perspective, and collaborative discussion. It will help them place their work as part of a bigger picture and offer ways to effectively collaborate and relate to people outside of their professional circle. Nonprofessionals and professionals in related fields will further benefit from the book's introduction to archival methods of collection management and collection development, and from a brief overview of archives terminology. Gathering a little basic knowledge based on professional standards will help non-archivists effectively administer the archival material in their care. This book outlines how to begin caring for collections in any setting so that those new to these concepts will come away with a sense of professionalism. In the past few years, the subject of collaboration between cultural heritage institutions has gained notoriety in professional literature. Yet, due to a shared history dating to the nineteenth century, when small museums were often housed in local libraries, and more recently due to the mandate of the Institute of Museum and Library Services and the 1996 Museum and Library Services Act, most studies have focused on the links between libraries and museums. Archives are mentioned as an aside or not at all. It is my intention to change the focus a bit. The artifacts and books handled by cultural institutions will benefit by increased attention on archives. As we focus our record collecting, so, too, are we better able to focus all of our collecting strategies. Furthermore, archives collection development is recommended as a first step toward redistributing our energies to collaborative collection development, which can then be followed by other cooperative activities. Within the masses of records we generate are those that have special import. Unfortunately, we often lose these among the mounds of papers that we accumulate regularly. When we refer to archives, we mean the noteworthy, unique, culturally reflective, recorded resources that require special care to ensure the continuance of society and knowledge. Archival records are made every day, yet their creators do not always recognize their value. Archives help form our community memories and shape our beliefs about history and the future. We need to identify them as distinct among the piles of documents that civilized societies create. This book discusses how to distinguish them and how to help others recognize them, too. With a little planning, archives and records management can increase understanding about the need for maintaining our cultural resources and recognizing the importance of the things that we create - of our material culture - in general. As repositories that collect records, we must raise awareness about archives, work to preserve them, and ensure that we are creating well-balanced collections of diverse materials offering multiple points of view. The best way to do this is for all organizations collecting local history materials to collaborate and create solid collection development policies based on collaborative work. This book emphasizes the need to form a solid foundation of collecting practices before pursuing other projects. These practices can form the base of operations to help make a cultural repository "successful." Though there are archivists, librarians, curators, historians, clerks, secretaries, volunteers, and private collectors who purposefully care for archival resources, many do not formalize their collecting plans or adequately review their collecting goals. Both professional archivists and "amateur" record keepers collect to document the history of their town or a chosen theme. Their goal is to create a "documentary record" of these subjects. Those without collecting policies do not adequately pay attention to documentation gaps or redundancy in collecting practices. Generally, collectors gather and preserve materials in areas that interest them or in areas where they perceive a dearth of collecting activity. Efforts to collect materials frequently compete with the collecting activities of neighbors or other organizations to which an organization has some sort of intellectual connection. In an attempt to document history, record keepers spread themselves thin while trying to gather historical records relating to broad topics. The quantity of records available in such a broad area is generally so vast that it is impossible for anyone to gather them alone. There are certainly enough materials to go around so that every repository that wishes to do so can find an appropriate collecting niche. Broad gaps in documentation often occur because of the competitive aspect of collecting that many institutions adopt, trying to get the most "valuable" materials related to the most prominent citizens in a community. Furthermore, many collect insignificant manuscripts lacking the depth of information that is most beneficial to researchers and society, just to keep a document that was written by someone noteworthy or that pertains to a subject they perceive as important. The collections of miscellaneous materials that are gathered come complete with large gaps in the information they are trying to reveal, while still overlapping with the readily available information kept by one's neighbors. Within this book are samples of a variety of repositories collecting and maintaining archives. These models serve to show how a community can deal with its documentation in a number of ways. It is not necessary to have a formal, centralized archives repository. Though I think having one is beneficial, many communities are working to adequately maintain their records through the historical societies, libraries, town halls, and other repositories that already exist within their communities. Dedicated volunteers, sympathetic government leaders, and knowledgeable professionals in non-archives fields have been able to start grassroots programs that try to make do with what they have or work hard to raise awareness and develop more professionally run archives-management programs. The intention of this book is to show that it doesn't matter what kind of archives program you have now: It is possible to propel attempts to organize projects through collaboration. It is possible to begin a strong commitment to archives management with a focus on collection development and planning, with even a minimal budget. It is possible to make things better, even when we cannot make things perfect. There is a dire need to rethink our collecting practices to ensure that we are properly documenting multiple historical perspectives related to the broad range of human activities and knowledge. This book discusses the need to better plan what archival material we will collect through archival appraisal, how to focus our own collections, and how to collaborate with others to most effectively preserve our history and heritage. It shows why collaboration and collection development must operate in tandem to be most successful. Like other books in the field, Cultural Heritage Collaborators: A Manual for Community Documentation discusses the steps for writing collection development policies and for making collecting decisions. It discusses using collection development as a foundation for all activities relating to archives in any cultural organization. It discusses how to do the planning necessary before a policy is actually written. Unlike other books, it presents these steps with a collaborative approach. It describes differing ideology and methods among diverse cultural heritage professionals with an eye toward merging philosophies and overcoming hurdles related to varying views and terminology. It promotes active relationships with partner institutions for collecting and collaborative outreach strategies to attract potential donors and collection users. 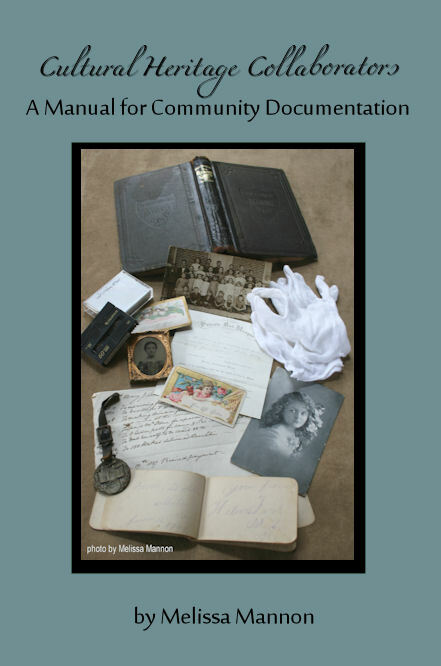 The book encourages institutions to incorporate a community documentation strategy. Such a strategy allows local repositories to find a collecting niche in their community, in a noncompetitive fashion, to actively seek records related to their mission, and to work with other repositories to create a collecting network that seeks to be all- inclusive, focused, and accessible. Beyond the scope of this book is a detailed discussion of the varying collaborative activities an institution can pursue beyond collection development. However, this book suggests collection development as a means to begin successful collaboration without an atmosphere of competition for resources, opening the doors for collaborative efforts in additional areas. It is often difficult for historical organizations to gain the support they need to adequately perform preservation, outreach, and digitization. Two or more organizations working to raise awareness about cultural resources will increase their exposure and hence find more individuals willing to help fund, volunteer, and sustain them. If Archives, museums, libraries, town governments, businesses, and local associations work together to create optimal collecting programs, it will lead to more successful activities in all areas of historical preservation and information dissemination. For an archives program to flourish and to perform collection development efficiently, it must have a strong sense of self. An archivist must be able to define the role her archives play in the community. You must be prepared to show outsiders that the institution is organized and is a vital entity with an important function. A vital step toward developing an image is to perform an internal survey of records that allows you to gain a better understanding of the scope of holdings, their strengths, and their weaknesses. This book ends with how to conduct a constructive survey project to further collection development and collaborative goals. A cultural institution is successful when it has a focused collection of interesting materials and a plan for further collecting that makes its resources more reflective of the community with which it is involved. A cultural institution is successful when it provides ready access to its cultural materials through "finding aids" or other access tools that are easily shared with outsiders. A cultural institution is successful when it has the resources it needs (including personnel and monetary support) to accomplish everyday tasks and to move the institution forward following established goals and a long-range plan. A cultural institution is successful when it is viewed by the majority of residents in its locale or its alternative target audience as a vital part of the community, invoking a sense of community spirit and standing as a place that reflects a sense of identity. Our documentary heritage is in danger. Materials are lost every day due to neglect and mishandling within and outside of cultural heritage institutions. This book encourages individuals to take a proactive approach to the management of cultural resources. Begin thinking about the nature, value, and condition of collections. Then take the first step toward caring for them by teaming with others to determine the needs of a community and the collections at hand. Aim to identify those documents needed to create a complete story about our society. No matter what the current condition of your collections, a thoughtful review of your situation and a collaborative planned approach will enable you to achieve success. The ultimate goal of this book is to show how through planning, management basics, and tying oneself to a community through collaborative operations, you can make your institution stronger and its mission more manageable. By rethinking the role a repository plays in archives management, you can come to be regarded as an integral presence within the community. Collaboration will ensure the security of our cultural heritage, its documentation, and the nonprofit cultural institution. If you are having trouble accessing our pull down menus see our site index. © 2000-2014, Melissa Mannon. All photographs and writings on this website are the exclusive property of Melissa Mannon and are protected under United States and International Copyright Laws. Photographs and writings may not be reproduced, copied, stored, or manipulated in any form without the written permission of the author.